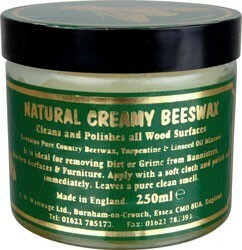 High quality traditional recipe containing only pure beeswax and genuine turpentine. Revives and enriches the natural patina wooden furniture to create a deep rich sheen. Suitable of all types of timber. Polishes and cleans, leaves a distinctive aroma. Manufactured in the UK by FLAG Paints Ltd.